What's on *your* pizza crust? 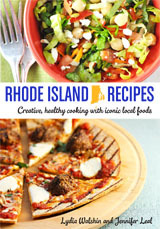 One of the things we love best about Rhode Island Recipes is the opportunity to introduce you to the real people behind the products we feature in the cookbook. Yesterday Jennifer and I visited with Roger Dwyer, founder and president of Top This! Pizza Crusts, to learn more about this local company that's bringing fire-grilled pizza crusts out of restaurant kitchens into home kitchens.